Australia's best-known whale is back. 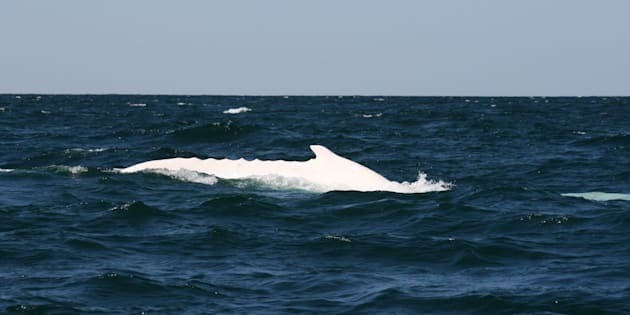 Migaloo is back in Australian waters. Australia's most famous whale has returned to waters Down Under, journeying along the nation's coast and delighting nature lovers on the way. Migaloo, the white whale, was spotted on Saturday on the Gold Coast, making his way south towards the Antarctic during his annual migration. The white giant delighted whale watchers off the Queensland coast, making a splash on his yearly southern voyage. "It was amazing you just see this glow in the water, this greenish and blueish glow, and then he surfaces and it's magical," one tourist told Channel Nine. The dazzling sea creature was first spotted in 1991 and has become a fixture up and down the east coast ever since. Migaloo is the only documented white humpback whale in the world and his name means 'White Fella' in Indigenous language.